Rugby Town Girls U12s opened our 2018/19 season with an away fixture at Measham. Spirits were high and it was clear the girls were glad to be back to playing league games after the summer break. The enthusiasm and positivity was great to see. With a large squad, we had the luxury of 4 subs. We made the decision for players to have a full half at least rather than swap sub players during the game, allowing for continuity and game development. The first 5 minutes were a bit frantic as both teams tried to get the measure of each other and settle into the game. Measham took advantage of players out of position and scored against Rugby within 3 minutes. This rattled Rugby, thankfully in a good way, and the girls responded with a quick reply to even the game at 1-1 within the first 5 minutes. Rugby now settled down and we started to see the first glimpses of some great teamwork from the players as the girls dominated midfield and moved the ball well up to the forwards with some precise and determined passing. Measham were clearly intent on pushing forward and gave Rugby a challenge a couple of times. Erin, in her first game for Rugby Town, did very well to stick close the Measham players, not allowing them to get a clear pass in, eventually clearing for a throw in for Measham which was dealt with easily by Rugby. Elle and Kelsey with busy developing a very impressive and productive partnership up front, with some great support from Tash. Tash had a great game today, displaying some sweet skills. Kelsey forced a corner, which was well delivered by Hannah. Unfortunately for Measham, the ball deflected off a defender for an own goal. From the restart, Measham again pushed Rugby and won a corner. Excellent defending from Rugby saw Hannah open in midfield position. Hannah made a great run upfield, releasing the ball to Kelsey who shot just slightly wide. The goal kick was collected by Elle, who skipped past several defenders, passed to Kelsey, who took a calm and accurate shot straight past the Measham keeper. From the restart, it was clear now that Rugby were becoming very dominant up front and in midfield. This left little for the defence of Ella and Erin to do. Impressively, they did not become complacent and were ready to cover and clear whenever Measham came forward. Elle J, over on the right wing, was having a cracking spell. Winning the ball again, she sped up to the Measham goal and was disappointed just to shoot wide. The winning formula in midfield continued, with the partnership of Elle,Tash , Kelsey and Hannah, being a pleasure to watch. The passing and awareness of the game was very good indeed. 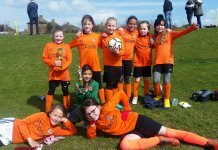 Elle J again won the ball, showing great tenacity in the tackles, a short run up the right wing and a superb pass to Kelsey, who again found the net with little fuss. Tash now had the wind in her sails on the left wing, and from the restart won the ball in midfield and took off up the wing. A couple of excellent dummies around the Measham defence allowed her to get to close to the left of the Measham goal, providing an excellent supportive pass to Kelsey, who again slotted the ball past the keeper. Kelsey, Hannah, Tash and Elle continue piling the pressure on Measham and had a couple of shots either just wide of the target or hitting the post. Measham were determined not to be browbeaten by Rugby and looked for any opportunity to take the play to the Rugby Girls, delivering some very good throw ins in the process. Rugby Town won another corner, although well delivered as usual by Hannah, it was cleared by Measham. Possession won back by Rugby and the dynamic duo of Kelsey and Elle charged back up finishing with Kelsey shooting just wide of the far post. The Measham keeper kicked downfield, picked up by the forward , who shot very wide of goal. Sophia kicked a brilliant ball, picking out Kelsey, who shot just over the cross bar. The Measham goal kick was collected by Hannah, passed to Kelsey, knocked on to Elle who scored a very well deserved goal! 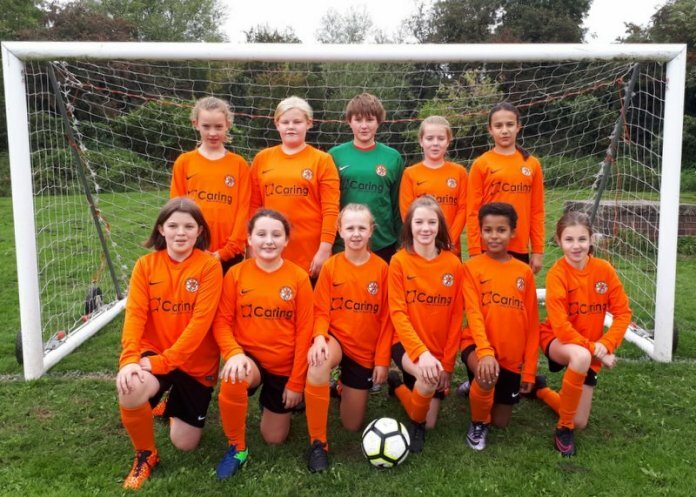 Fresh legs for this half as Evie came on in defensive midfield, Ava on the wing and a brand new defensive team of Issy and Ellie. Evie playing out of her usual position on the wing, showed what a versatile and flexible player she is, with great game awareness and ensuring she was where she needed to be. She also took some very good throw ins and corners. A very good half from Evie today. A throw in by Rugby down by corner flag allowed Rugby an opportunity to open the scoring in the second half. Ava was unlucky to just shoot wide. The goal kick saw the ball back deep in Rugby’s half. Ellie noticed the threat early and made a great defensive run and determined clearance. Not a lot was getting in Ellie’s way today! 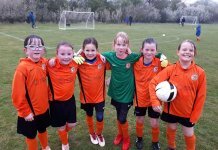 Evie, Ava, Kelsey and Elle were developing their partnership, replicating the very positive team performance in the first half. Ava and Kelsey pushed forward with a couple of great passes. Ava had a shot which the keeper parried straight to Kelsey’s feet, who was caught a little surprised and shot wide. Rugby won the ball back, the forward dynamics all aligned and Ava scored a great goal from a ball rebound from the Measham keeper. Measham still pushed forward and Issy in the right back position, was called upon a few times to clear balls. Issy played with great positivity today and showed very good player awareness. An excellent penetrative pass from Issy to Elle open up the game again and Elle’s second goal of the game. Evie, Elle and Issy worked very closely together during the second half to ensure Measham were closed off during any attempts to push on the Rugby goal. 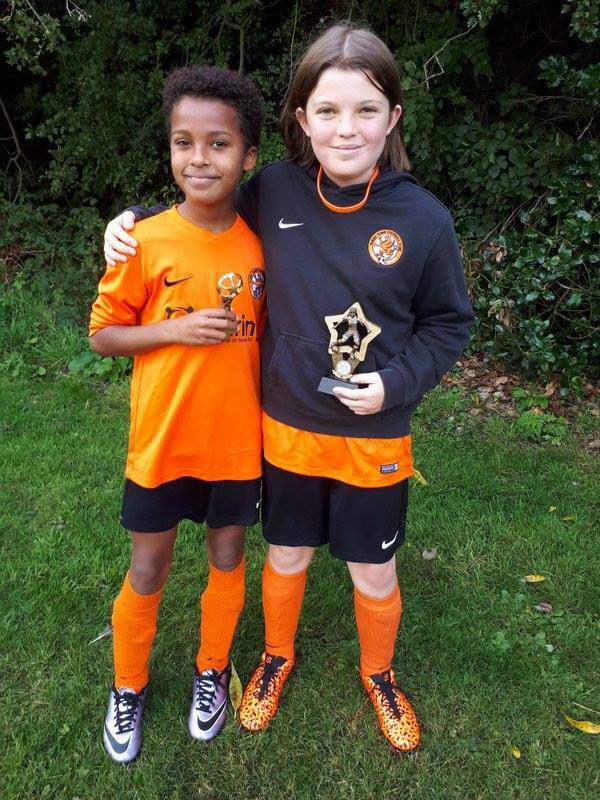 Most notably, Ellie and Issy worked together to run the striker off the ball from a very dangerous position, denying a shot on goal. Back up to the Measham half and Kelsey, Ava and Elle were still proving to be a deadly attacking force with several more shots on target. Ava had a shot saved. Winning back possession, Elle delivered a sublime chip over the Measham defence, right at the feet of Kelsey, although this move didn’t result in a goal it was certainly one of the moves of the game for me. The final minutes of the game continued at the same pace with Rugby pushing forwards. Measham took this opportunity to counter attack and released a fantastic strike from the right, beating Sophia, for a very impressive goal. From the restart, Kelsey and Ava were straight back up to the Measham goal. Some excellent positioning and an awesome layoff from Kelsey allowed Ava to finish the game with a goal. Some great individual performances were only bettered by an outstanding team display today. A great win for our first game of the new season. 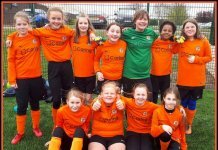 Well done Rugby Town Girls U12s!